Naming Trends And How Parents-To-Be Face 'Baby-Name Hostility' : The Baby Project When people find out they're expecting, choosing a name for their baby can be one of their most stressful tasks. 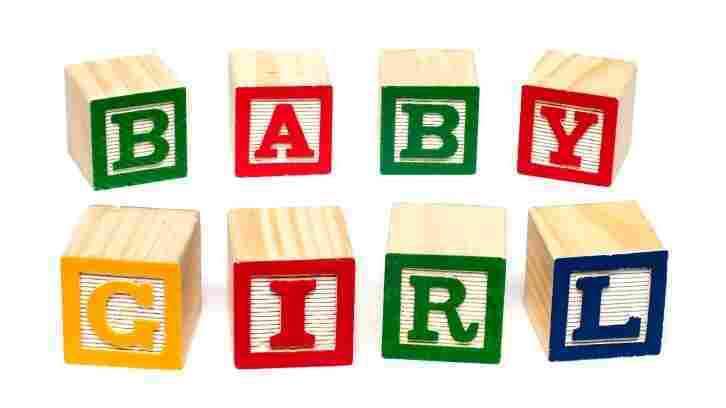 Baby name wizard Laura Wattenberg explains why — and tells us about naming trends today. When people find out they're expecting, choosing a name for their baby can be one of their most stressful tasks. Part of that stress is because there has been a "baby-naming revolution" over the last half-century, says Laura Wattenberg, who wrote The Baby Name Wizard: A Magical Method for Finding the Perfect Name for Your Baby. While people used to choose the same name — like John and Mary — century after century, naming is "wide open today," Wattenberg tells All Things Considered co-host Michele Norris. Parents are getting more and more creative, inventing names and spellings. "There's name rage in the streets," Wattenberg says. "People write in to us raging against what their neighbors name their babies. Everyone wants to be different. That's the No. 1 thing we all have in common." That may be why your best friends or children are keeping mum about the names for their child. They don't want to feel the hate. So what are the trends today? Today, a third of American boys get a name ending with the letter "n." And girls more often than not get a name ending with the letter "a." Wattenberg's website shows the most popular names over the last century and gives parents tools to help make their decision. Her blog also puts popular names in the spotlight and explains their origin. See the most popular names over the past half-century. Parents will take names wherever they can find them, says Wattenberg, even if it's a destructive hurricane like Katrina or an evil movie child like Gage (of Pet Sematary). As long as the name is attractive, they'll use it. Also, parents today are more willing to use ethnic names, Wattenberg says. Should We Pick A Name With Pizazz Or One That Protects Our Kid From Bullies? "There was a time when immigrant parents automatically chose an English name for their children to give them an advantage," she says. "Today we're actually seeing second- and third-generation immigrants turning back to their grandparents' homeland and choosing names from other cultures," she says. There's a 100-year cycle in name trends, according to Wattenberg. Like the names Emma and William? They were popular in the 1880s. "What you're looking at is your great-grandparents' generation. Our own names are too ordinary, our parents are too boring, our grandparents sound old. But when you get back to your great-grandparents, you never were surrounded by those names, so they sound fresh again," she says. Sarah Crossman: [My husband and I] are totally in agreement about a boy's name and have no problem telling everyone what it is (Finn, in honor of his land of conception). But we're really torn about a girl's name and feel like we really need to meet her before we can name her. And we're kind of keeping those names under our hats. Lucy Peck: We had a name picked out before we were married, and we've been telling people since then! We are going to name our little boy Dexter Aaron. The name comes from the Showtime show Dexter, of which we are big fans. We really like the unique, yet simple, sound of the name. And I've always wanted to give my first son his father's name as his middle name. Plus, Dexter Peck sounds like the name of a private eye from a noir novel, doesn't it? Lateefah Torrence: The biggest conflicts [between my husband and me] have been issues of class perception. I like esoteric/historical names and Frank often finds them pretentious, which has led to many "discussions" about what a name says about a parent's expectations for his or her child. Read more about Lateefah's and Frank's difficulty picking a name — and see if you can help.